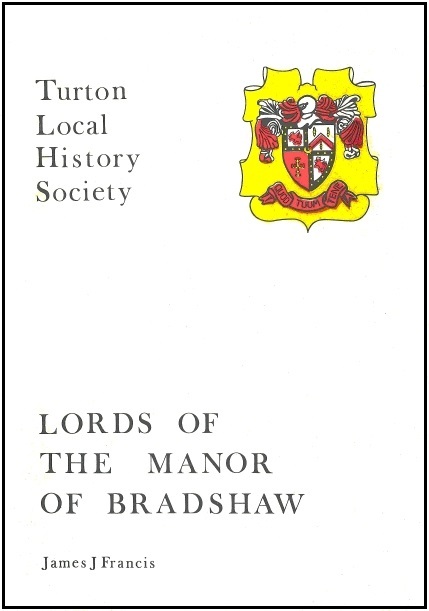 Grant to Helen Bradshaw, 30 September 1449 a.d. 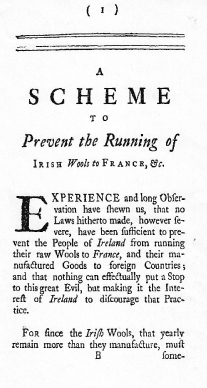 Warrant of Attorney; 21 May 1492 a.d.
Irish Wools to France, & c.
Experience and long observation have shewn us, that no Laws hitherto made, however severe, have been sufficient to prevent the People of Ireland form running their raw wool to France, and their manufactured Goods to foreign countries; and that nothing can effectively put a stop to this great Evil, but making it the Interest of Ireland to discourage that Practice. 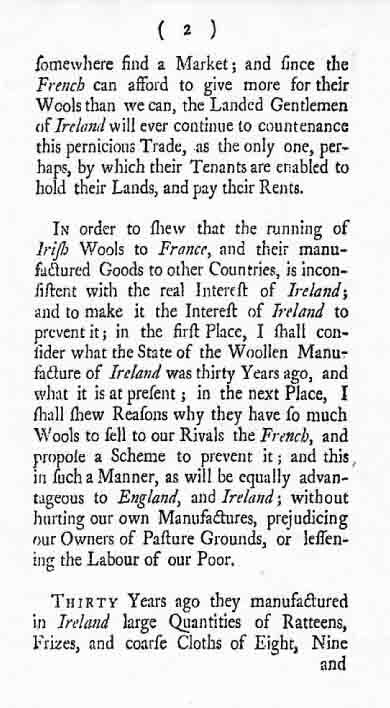 For since the Irish Wools, that yearly remain more than they manufacture, must somewhere find a Market; and since the French can afford to give more for their Wools than we can, the Landed Gentlemen of Ireland will ever continue to countenance this pernicious Trade, as the only one, perhaps, by which their Tenants are enabled to hold their Lands, and pay their Rents. 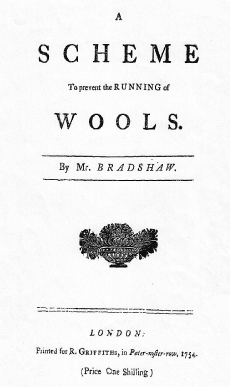 In order to shew that the running of Irish Wool to France, and their manufactured Goods to other Countries, is inconsistent with the real Interest of Ireland; and to make it the real Interest of Ireland to prevent it; in the first Place, I shall consider what the State of the Woollen Manufacture of Ireland was thirty Years ago, and what it is at present; in the next Place, I shall shew Reasons why they have so much Wool to sell to our Rivals the French, and purpose a Scheme to prevent it; and this in such a Manner, as will be equally advantageous to England and Ireland; without hurting our own manufacturers, prejudicing our Owners of Pasture Grounds, or lessening the Labour of our Poor. 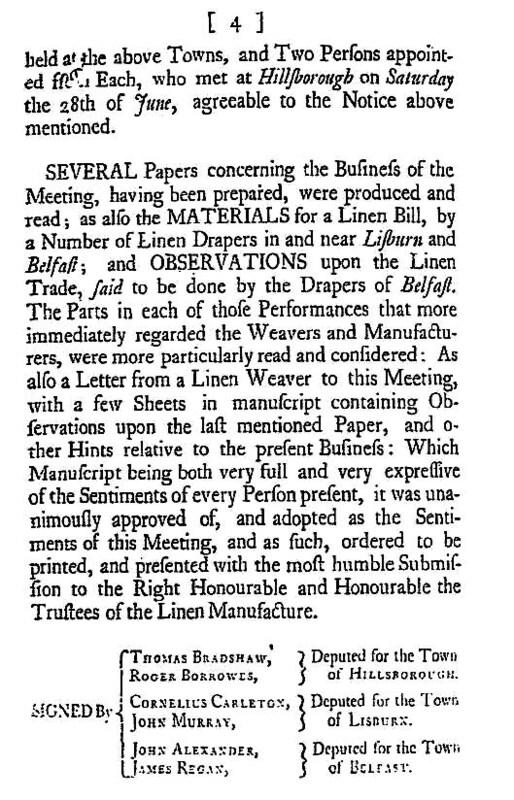 Reference the above "Observations of The Linen Trade" by the Linen Weavers and Manufacturers of the Towns of Belfast, Lisburn, Hillsborough and Country adjacent. 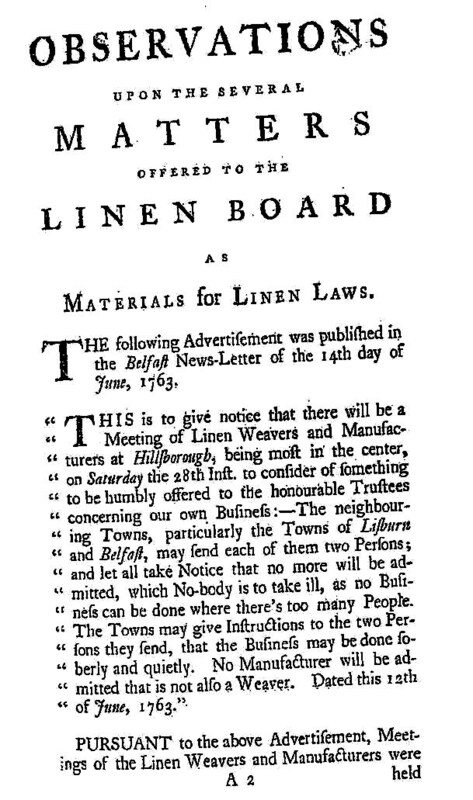 On 28th June 1763, Thomas Bradshaw & Roger Borrows Deputed for the Town of Hillsborough at the meeting of Linen Weavers and Manufactures for the Towns of Belfast, Lisburn, Hillsborough and Country adjacent. No manufacturer would be admitted who was not also a weaver. The meeting of six Deputies addressed two specific issues which caused great hardship to weavers - Damnified Flax-seed coming from Scotland and pending legislation to prevent steeping flax in running water. To all people to whome these presents shall come, Greeting. And to Do, Perform, and Execute, all their Lawful Acts, and Things, Powers and Authorities, which are Requisite and Necessary to be done and Executed, in the discharge of the said Office and Trust, for and During such Time as We, or the Chief Commissioners of His Majesty’s Revenue, for the time being, shall Think fit. And all Justices of the Peace, Mayors, Sheriffs, Constables, and all other His Majesty’s Officers Whome it may concern, are hereby Prayed and Required to be Aiding and Assisting unto him the said Samuel Bradshaw in the due Execution of this Our Commission. IN WITNESS whereof We have hereunto set our Hands and Seals this ninth day of December in the thirty Seventh Year of the Reign of our Sovereign Lord GEORGE lll , by the Grace of God of Great Britain, France, And Ireland, Kind, defender of the faith , in the Year of our Lord 1796. We do hereby approve of this Appointment. Given at His Majesty’s Castle of Dublin the 13th day of December 1796. "When are they coming over?" Will they really come?" Every officer and man was asking himself these questions as soon as the "KONIGSBERG" had left Rosyth carrying with her Admiral von Meurer and the other German delegates who had been in consultation with Sir David Beatty, the Commander-in-Chief of the British Fleet. We had not long to wait before we knew the answer to our queries. Signals from German Wireless Stations to Rosyth and from the British Commander-in-Chief to the Germans were intercepted and at about 4.30 P.M. on the 20th November, 1918, the orders arrived for Operation 'Z Z' - a very appropriate title for what should be the very last operation in the Great War. We - the First Light Cruiser Squadron were to leave harbour early in the morning of the 21st so as to be in a rendezvous by 8.0.A.M. when we should meet the German ships which were to be handed over to us in accordance with the terms of the Armistice. Three light cruisers were chosen to leave harbor before the remainder of the Grand Fleet in order to meet the enemy and lead him to harbour; the three ships H.M.S. "CARDIFF" (flying the flag of Rear Admiral Alexander—Sinclair, our late Admiral), H.M.S. "PHAETON" and H.M.S. "CASTOR" flew huge blue ensigns at the foremast so that the enemy could distinguish them easily and take station astern. At 2.15 A.M. in the morning of 21st we got under way and by 2.40 A.M. had passed Black Gate closely followed by the remainder of the Grand Fleet spread in two lines and advancing at 10 knots. We had to turn 16 points at about 8.A.M.and then again some time later as we were somewhat before our time. The Twenty-first ("DER TAG") dawned on our Mighty Armada, cold and bleak with a slight mist hanging over the dreary expanse of North Sea which had been our Hunting Ground for the past four years during which time we had but a few chances of trying conclusions with enemy warships. Though fairly calm for the North Sea, there was sufficient chop on the water and the sun - trying to break through - made a picture which will ever remain imprinted on the memories of those who had the good luck to be there. As the time wore on we began to wonder whether the Germans were going to come after all and keep the agreement made between Sir David Beatty and Admiral von Meurer. We were not kept long in doubt as our advanced destroyers soon reported that 15 enemy heavy ships were steering towards the appointed rendezvous. We had early breakfast and at 8.15. A.M. all hands went to Action Stations as we were not going to trust ourselves to an enemy who had shown himself to be such a treacherous foe during the last 4 years. All our guns were tested by firing tubes and projectiles were placed in readiness so that fire could be opened at the first sign of treachery on the part of the enemy ships. At about 8.30 A.M. a Kite Balloon was sighted on the Starboard bow and soon H.M.S. "CARDIFF" (who was towing the balloon) came in view, distant some 5 or 6 miles Astern of her with white flags flying and smoke pouring out of their funnels came the pride of the German High Sea Fleet - their Battle Cruisers the "SEVDLITZ" flying the broad pennant of Commodore Tagert, the "MOLTKE" the "DERFFLINGER" the "HINDENBERG" and the "VON DER TAN". Their guns were trained in the securing position fore and aft and no man could be seen on deck. The ships themselves presented a magnificent sight with their powerful lines and huge funnels from which issued volumes of smoke as their stokers exerted themselves to reach the Firth of Forth for their first view of Great Britain. Astern of the Battle Cruisers came the enemy Battleships - the "FRIEDRICH DER GROSSE" flying the flag of Rear Admiral von Router (The Admiral in command of the whole force), the "KONIG ALBERT", the "KAISERIN", the PRINZREGENT LUITPOLD" the "KAISER" the "BAYERN" the "GROSSER KURFURST", the "KRONPRINZ WILHELM" and the "MARKGRAF". About 3 miles astern of the Battle Ships came the enemy light cruisers led by H.M.S. "PHAETON" in the following order; the "KARLSRUHE" flying the broad pennant of Commodore Harder, the "FRANKFURT" the "NURNBERG" the "EMDEN" the "COLN" the "DRUMMER" and the “BURMMER” and the "BREMSE". 50 of their latest and finest destroyers brought up the rear led in by H.M.S. "CASTOR" and preceded by a line of British destroyers in single line abreast and further escorted by two lines of our destroyers on either side of them. Our guns meanwhile though, to every appearance 'dead' and trained fore and aft were very much 'alive'; all the guns' crews were closed up and the correct range and deflection of the enemy ships were kept set on the sights so that it only required a few seconds to train the guns round and open fire should the enemy dare make a last desperate effort. Surrounded on every side by British, American and French Men-of-War, the German Ships sailed up the Forth through the Grand Fleet which was divided up into two lines, that to the North being composed of ships from the following squadrons (commencing from the East): - The 1st & 6th Light Cruiser Squadrons, 1st Cruiser Squadron, 5th 6th and 2nd Battle Squadrons, H.M.S. "QUEEN ELIZABETH" (Flagship of the Commander-in-Chief, Grand Fleet) 1st Battle Cruiser Squadron and H.M.S. "LION" (Flagship of the Battle Cruiser Force) and the 4th Light Cruiser Squadron. The line to the South was composed of Ships from the following squadrons (commencing from the East):- 3rd & 2nd Light Cruiser Squadrons, H.M. ships "MINOTAUR", "VINDICTIVE", "FURIOUS", 4th & 1st Battle Squadrons, 2nd Battle Cruiser Squadron and the 7th Light Cruiser Squadron. In addition to these ships the Connecting Ships (Used for signalling purposes) "KING ORRY", "BLANCHE", "BOADICEA", "FEARLESS", "BLONDE" and the French Man-of-War the "AMIRAL AUBE" with attendant destroyers and a large number of British Destroyers from the 3rd, 11th, 12th, 13th, 14th, 15th,, 20th,, and 21st Flotillas so that very little chance was offered them should any dare to make an attempt to escape. As we shaped our course up the Forth the German destroyers en masse were on our Port Beam but we drew ahead until the enemy cruisers were abreast of us. As was natural such a large force of ships took some time to pass through the narrow entrances to the Forth so that we had constantly to ease down so as not to overlap the many squadrons ahead of us. About 3.0.P.M. we sighted May Island on our Starboard Bow and the German Ships forged ahead. Towards 4.0 P.M. when about 3 miles East of Inchkeith we came across the German Ships who had by this time anchored surrounded by one of our Light Cruiser Squadrons and the 1st Battle Squadron comprised of some of our most powerful ships.. They are still there as I am writing this little account of their surrender and a more humiliating day for Germany than the 21st November, 1918, will be hard to discover. Manley Ostrander and Charles G. Crouse. 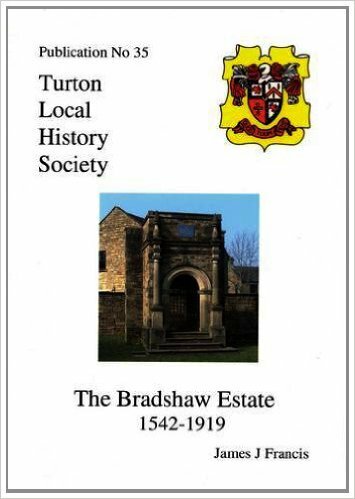 James Bradshaw, son of William Bradshaw & Mary Niblock, was baptised October 20th, 1723 in Seagoe Parish Church, County Armagh. Between October 1726 & 1728, the family immigrated to America and settled in New Milford, Connecticut, New England.